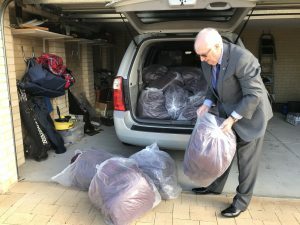 A fortnight ago, Rotarians Peter and Marilyn Gregory collected a large number of blankets, which had been donated by Qantas. 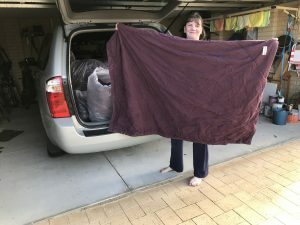 International Director Peter and Marilyn made the trip to South Guildford to collect the airline blankets. As can be seen from the photos, their car was full to the brim. Decisions are ongoing to determine the recipients of these blankets. Thank you Qantas.